THIS IS A FACTORY RE-CONDITIONED ITEM. IT WILL HAVE SIGNS OF BEEN USED, THEY HAVE ALL BEEN TESTED. THE BOXES MAY BE DAMAGED BUT THE CONTENTS ARE WORKING FINE. Grade C - Used or Good condition. Essential parts have been replaced. There may be some light cosmetic damage on the product, such as scratches and scuff marks. Please note that the griddle pan is NOT INCLUDED for this item and the images are for illustration purposes only. 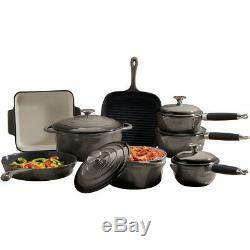 Cooks Professional Eight Piece Cast Iron Set. Traditional styling; Make a statement with stylish pans, dishes and lids. Last for years; Well-seasoned cast iron cookware will never stick, and will be a focal part of your kitchen cooking for many years. Even heat distribution; No cold or hot spots, cook evenly at both high and low temperatures. Versatile; Suitable for ovens, gas, induction, ceramic, electric and halogen cooker tops. 8-piece set; Available in 5 different colours to suit your preference. 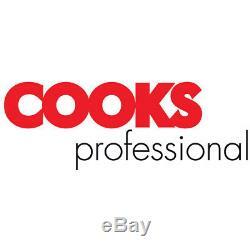 Cooks Professional Deluxe Eight-Piece Cast Iron Cooking Set. Cook up a feast with this eight-piece, cast iron cooking set from Cooks Professional. Made from high-quality cast iron, this deluxe collection of cookware will look great in any kitchen and will help you create a whole range of delicious meals. Use it in your oven, on gas, induction, ceramic, electric and halogen cooker tops. The cast iron will distribute heat evenly, meaning not hot or cold spots so everything you will be cooked to perfection, without any burnt or undercooked areas. From casseroles to grills, you can create a variety of culinary delights. 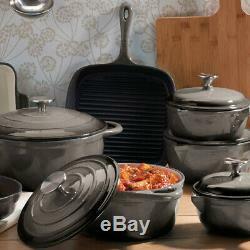 The set includes: a medium casserole dish (21cm) perfect for a one-pot bake, and large casserole dish (26cm) ideal for roasting a joint of meat; a roasting dish, great for all your roast potatoes and vegetables on a Sunday, a frying pan (25cm) perfect for a fry up, and a griddle for cooking the perfect steak and asparagus. Also included is a small saucepan (14cm), perfect for heating up sauces and soups or boiling an egg, a medium pan (16cm) which is ideal for cooking your Sunday roast vegetables and a large pan (18cm) perfect for cooking pasta for the whole family. 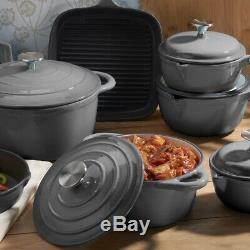 The saucepans and casserole dishes have stainless-steel lid handles and the saucepans feature phenolic handles. All three saucepans and the griddle have a built-in spout, making pouring easy to avoid unnecessary mess. Please note: The cast-iron cookware is not suitable for use in microwaves. 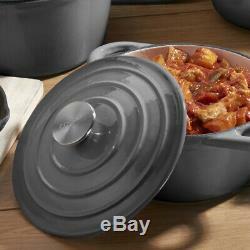 Medium Casserole Dish Diameter: 21cm Capacity: 2.4L Weight: 3.9kg. Large Casserole Dish Diameter: 26cm Capacity: 4.8L Weight: 5.9kg. Small Saucepan Diameter: 14cm Capacity: 0.9L Weight: 2kg. Medium Saucepan Diameter: 16cm Capacity: 1.3L Weight: 2.7kg. Large Saucepan Diameter: 18cm Capacity: 1.9L Weight: 3.4kg. Roasting Dish Dimensions: L28 x W23.5 x H4.3cm Weight: 2.6kg. Frying Pan Diameter: 25cm Weight: 2.2kg. The item "Kitchen Cookware Cast Iron Pots Pans Ovenware Set 7 Piece Oven Proof GRADE C" is in sale since Tuesday, February 12, 2019. This item is in the category "Home, Furniture & DIY\Cookware, Dining & Bar\Pots & Pans\Pan Sets". The seller is "clifford-james-discount-store" and is located in Skelmersdale, Lancashire. This item can be shipped to United Kingdom.